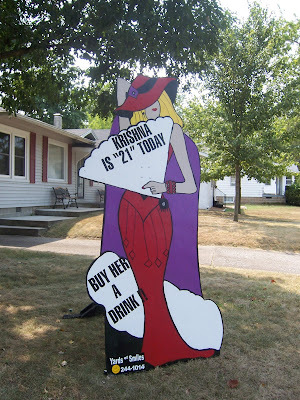 This showed up on Krishna's front lawn on what she claims was her real 21st birthday. Whoever ordered this sign must have believed she was either 19 or so or celebrating her 5th or 6th 21st birthday. Oh sure, I bet she's really turning "29". Krishna is more than 21 *centuries* old at this point. Maybe the sign is referring to his reincarnation? I didn't know the Red Hat Society was accepting 21 year olds.